There is nothing more important to the look and feel of a room than good indoor lighting. No matter how great your decor or furniture are without the right lighting it can look dull and cold. Your home’s lighting also must be functional and flexible with the way you live in your Bentonville home. There are many different facets in choosing interior lighting for the rooms in your home. You must consider what the room will be used for, what functionality do you need from the interior lighting, the style and aesthetics, maintenance requirements and other important factors. Another important factor is do you want energy efficient interior lighting to help with that costly power bill. At Davitt Electric, our Bentonville lighting experts can guide you every step of the way in your interior lighting project. We provide custom interior lighting, lighting consultations, lighting installation and more. We pride ourselves on have quality service and amazing customer service. You can always expect that our Bentonville electricians will always get the job done right the first time. 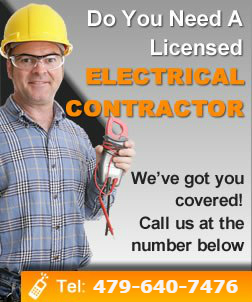 Our Bentonville electricians are master electricians who are both licensed and insured. Call today for your next in-door lighting project.